Sinbad, one of our adoption kākāpō. Your adoption directly supports funding for kākāpō health management, supplementary food and annual transmitter changes. Renew your adoption annually to receive updates about your chosen kākāpō. Prices are in New Zealand Dollars (NZD). Adoption packages can be sent worldwide. Allow at least two weeks for us to process your order and get it in the post. Are you a teacher? Email kakaporecovery@doc.govt.nz and ask about our special classroom deals. 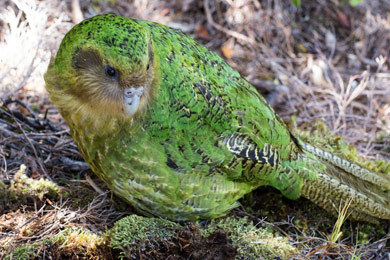 Gulliver is one of only three kākāpō carrying genes from Richard Henry – the only Fiordland bird to contribute to the current population. 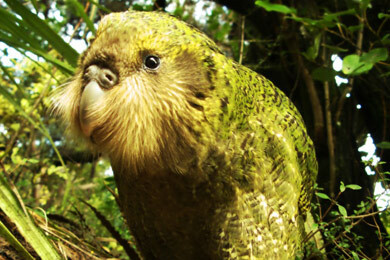 Gulliver’s ability to breed successfully is crucial to ensuring genetic diversity in the kākāpō population. Gulliver is often found hanging out in piles of rocks. He has a series of these ‘castles’ in both his summer and winter ranges. This can make catching him quite a challenge – we ended up lowering a ranger down into a rocky cave by his legs on one occasion! In 2016, Gulliver mated with Pura. Her single egg died very early in development, so we couldn’t confirm Gulliver was the father. A CGI version of Gulliver starred in an advertising campaign by our partner Meridian Energy. Kuia is the only female carrying genes from the Fiordland bird: Richard Henry. She bred for the first time in 2016, but made the unfortunate decision to nest in the middle of a seal colony. She was harassed by sandflies and couldn’t sit still. She knocked her eggs around and accidently damaged one, so we decided to remove the eggs for incubation and close the nest. Fortunately, it was still early in the breeding season and Kuia mated again. This time, she picked a much better nesting site and laid a further three eggs. In total, she successfully produced four chicks: Gertrude, Adelaide, Marian and Henry. Sinbad had an adventurous start to life. He was the youngest and smallest of three chicks hatched to Flossie and Richard Henry in 1998. He couldn’t get the food he needed to survive, so staff removed him from the nest and hand reared him. After gaining weight, Sinbad was put on a plane headed for DOC’s takahē rearing unit in Te Anau. A respiratory problem struck him mid-flight, but a quick-thinking airline attendant fitted him with a modified oxygen mask. He recovered in a Christchurch hotel before making the rest of the journey by car. Sinbad is a curious bird and will often investigate what staff are up to. He’s also attractive, with immaculate plumage, large eyes and very tidy eating habits. Sinbad set up his first track-and-bowl system in 2009 and was successful in mating with Cyndy that year. He didn’t produce any chicks of his own, but staff have high hopes for him and his brother Gulliver to breed successfully in the future. 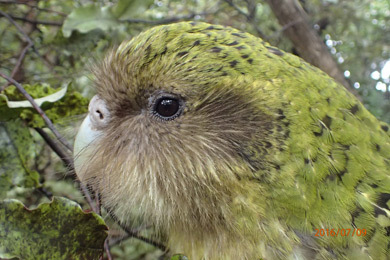 Felix is one of the most successful males in the kākāpō population. He mated about eight times during the summers of 1997 and 1999, fathering six chicks: Tiwai, Sirocco, Manu, Boomer, Morehu and Trevor. In the 2002 season, he mated with a further five females and fathered Hine Taumai, Aparima, Tumeke and Aurora (who died in 2004). He also fathered Hoki. He fathered a further three chicks in 2016: Faulkner, Attenborough and Punga. We must be careful not to let Felix’s genes dominate the next generation, because it could lead to inbreeding problems. We’re not sure why Felix is such a hit with the females. He’s a healthy bird, but not particularly large. He may have top-notch display skills, such as booming, which would make him attractive to females. Flossie is best known as the bird that Richard Henry took a shine to in 1998. They produced three chicks together, perpetuating his Fiordland genes in a population dominated by those from Rakiura. 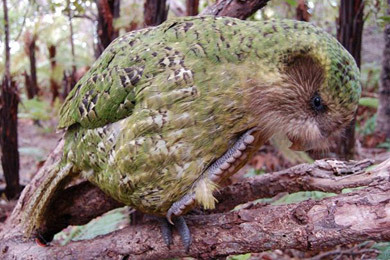 It was the first time Richard Henry mated successfully, and the only time that kākāpō bred on Maud Island. Flossie chose to nest on the steep slope of a pine plantation, and fed her chicks extensively on pine needles. 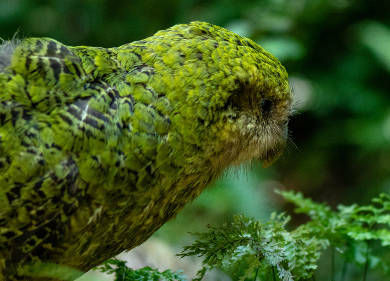 Up until then, we thought kākāpō would always prefer mixed native vegetation, and not the monoculture offered by a commercial forestry species. With 11 living chicks, Flossie is the most productive female kākāpō to date. She’s also consistent and has laid three fertile eggs during each breeding season. Lisa was part of a translocation from Rakiura to Te Hauturu-o-Toi/Little Barrier Island to keep them safe from cats. 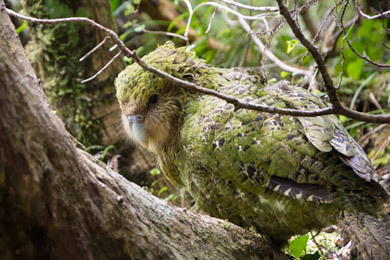 We removed her transmitter and she evaded our detection for 13 years – despite searches with kākāpō dogs and cage traps baited with kūmara and apple treats. 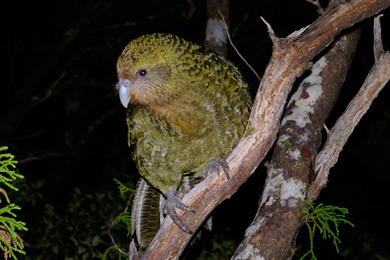 Most Hauturu kākāpō were translocated to other islands during 1996–98, mainly due to ineffective breeding caused by the presence of rats and lack of rimu trees. Just five males remained, and two females were unaccounted for. In 1999, fresh mating sign at a track-and-bowl site meant one of those females was alive. 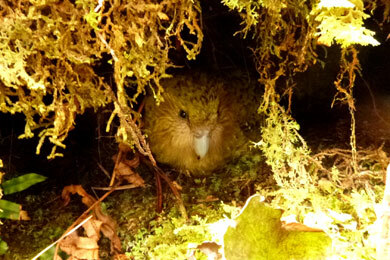 We used kākāpō dogs to search for a nest, and found Lisa sitting on three eggs at the base of a hollow tree. Ellie, Hauturu and Aranga hatched from those eggs after being hand reared. We gave Lisa a fresh transmitter, and shortly after tried to catch her for translocation. But, reluctant to leave, she began to roost in tall trees. We had to use ropes and climbing gear to reach her perch, 25 m above ground. Lisa has laid over 20 eggs, but her hatch rate remains low. 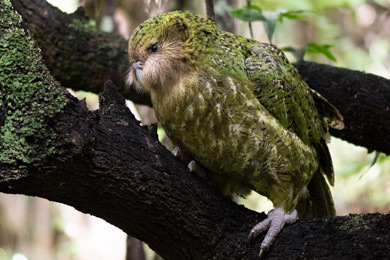 Low hatch rate remains a curse for kākāpō, which is why artificial insemination and retaining genetic diversity are high priorities. Nora is the matriarch of the ‘wind dynasty’ – her daughter Zephyr and grandson Sirocco continue the wind theme in their names. Nora was the first nesting female found on Rakiura. 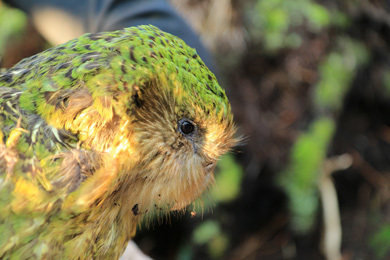 Her capture marked a major turning point in the battle to save kākāpō. She hatched three chicks on the island, fledging Adler and Zephyr in 1981. Zephyr is now one of the most productive breeders. Nora was one of the initial founders moved to Codfish Island/Whenua Hou in 1987. When the island underwent rat eradication in 1998, she was moved to Maud Island. Three years later she returned and settled back in her previous home range. She nested again in 2002. Her own eggs were infertile, but she did a superb job of rearing one each of Cyndy and Ruth’s chicks: Horton and DOC. Nora also fostered her granddaughter Hoki for a few weeks in 1992. In 2016, she successfully bred again for the first time in 31 years, producing Kōtiu and Matangi. Genetic evidence suggests that Rangi is likely to be Zephyr’s father, and so the grandfather of most of the ‘Wind Dynasty’. He’s also an escape artist. After he was transferred to Codfish Island/Whenua Hou in 1987, Rangi went into hiding. We didn’t find him again until 21 years later, when a ranger heard booming from a bird that didn’t have a transmitter. Even today, Rangi proves difficult to catch. He runs away from rangers when he hears them approaching and seems to head for the densest and most tangled patches of bush where it’s hard for us to follow. Bluster-Murphy was just plain old ‘Bluster’ until he was saved by vet Joanne Paul-Murphy. 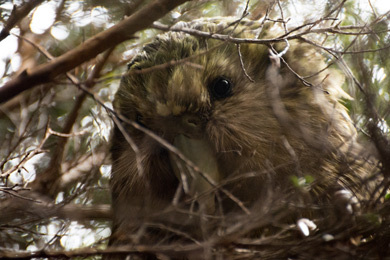 When Bluster was a chick, he was attacked in his nest by a male kākāpō. He lost two toes, but lived to tell the tale thanks to Joanne. He seems unaffected by his mild disability. Bluster is now a rambunctious teen. He enjoys stealing other birds’ food and yelling at older males at their bowls. JEM almost didn’t make it out of her shell. Her mother accidentally dragged the unhatched egg out of the nest. It sat in the pouring rain for three hours before we rescued it for artificial incubation. However, she proved to be a great foster mum, incubating and hatching another egg and caring for a number of chicks during the season. Marama is the smallest, most delicate little female in the kākāpō population. She nested for the first time in 2016. Although all her eggs were infertile, she proved to be an excellent mum. She fostered other chicks and raised Gertrude, one of Kuia’s chicks. She was very calm on her nest, even allowing rangers to check on her eggs and chicks while she was present with no fuss. One young supporter said that he’d chosen to adopt Marama because she was such a good mum to chicks that were not hers: “Some naughty birds make babies but don’t take good care of them and you want a mum to take care of them”. Ralph sparked a global passion for kākāpō when Douglas Adams and Mark Carwardine met him and featured him in the book Last Chance to See. He was also painted by artist David Cemmick. 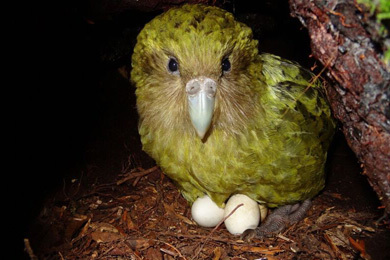 Waikawa was the first kākāpō to hatch successfully after being artificially incubated immediately after the egg was laid. In 2016, she became the youngest female kākāpō to successfully breed. Sadly, only one of her four chicks survived to fledge. While she proved to be an excellent mum and had an impressively huge and waterproof hollow under a rock for her nest, intense rain caused flash flooding on the island, which wiped out her nest. Her one surviving chick was raised by another female and was named Makorea, meaning survivor. Adoptions are not exclusive, meaning that multiple people can adopt the same bird. The adoption birds have been selected from our current population. 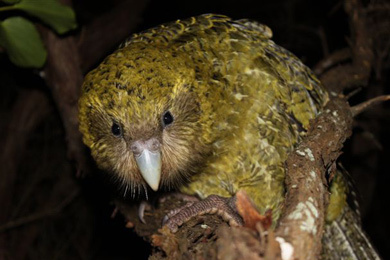 Adoption is symbolic – kākāpō are a taonga (treasured) species, so no one can 'own' a kākāpō.